The experience of real estate agents varies dramatically, and yet it is amazing how many buyers and sellers seem unaware of the importance of having an agent with valuable experience. Can you imagine hiring an agent who has never closed a transaction? Many do without asking about experience. Believe it or not, many buyers hire the first agent who answers the phone (or email) with no interview and no qualifying whatsoever. Now if you were buying a hamburger or a used car, no big deal if your sales person has little or no experience (or knowledge), but you’re buying a house that will cost you six figures. I assume that was money you worked decades to save. Maybe the experience of real estate agents is important after all. 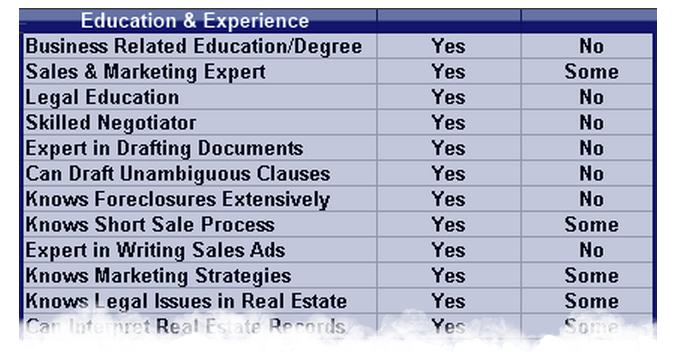 What is the requisite experience of real estate agents in order to get a license? None. They don’t have to have any real estate background, no marketing and sales experience, no business experience, no negotiating experience, no contract experience, no legal experience, no customer service experience, no technical experience, no software experience, and no Internet experience. Everyone has to start somewhere, right? Just not on your nickel. Let the inexperienced practice with someone else’s money and someone else’s life, not yours. If you’re a buyer or a seller, the experience of real estate agents you may hire is not a casual or minor issue–it is a huge issue, a major issue, one of the most important decisions of your life. Your agent doesn’t have to have the experience of a Chuck Marunde, but why settle for less, and why settle for a lot less. Chuck is one of the nation’s foremost experts on real estate transactions, and he’s right here in Sequim, Washington. Having previous experience as a real estate attorney for 20 years, he is the author of numerous real estate books, and has published thousands of articles for buyers on the Internet. His experience, knowledge, competence, and professionalism is second to none. If you are planning to buy or sell in the Sequim area, why not see if Chuck Marunde can get you in his schedule. (See his resume here: Sequim Real Estate Broker) When it comes to the experience of real estate agents, I strongly urge you to choose your Realtor carefully.